They can’t get broadband where they live. They don’t see the upside to modern information technology. Some 62% of dial-up users say they aren’t interested in switching to broadband. The April 2008 survey repeated a question posed several times in the past that asked dial-up user if they would like to have a faster broadband connection – or whether that is something they are not interested in. Just more than one-third (36%) say they would be interested in a switch, with 62% saying they would not be interested in changing to broadband. This figure hasn’t changed much since October 2002. The roughly 60% of dial-up users consistently saying they are not interested in broadband, in the face of the shrinking pool of dial-up users, suggests that the preferences of dial-up users change over time. That is, assuming that many of those interested in getting broadband switched over to it from December 2005 to May 2008, some of those who said they were not interested in broadband in 2005 replenished the supply of “yes, interested in broadband” responses in order to maintain the 40-60 ratio of those interested in broadband versus the uninterested. Many dial-up users say that they can’t afford broadband. When pressed as to what might lure them into the ranks of home high-speed users, a plurality of dial-up respondents cited price. One-third (35%) of dial-up users said that they would switch to broadband if the price became more affordable and, as noted above, there remains a sizable gap in what dial-up users pay monthly for online access and what broadband users pay. Affordability matters: 35% of dial-up users say they would switch to broadband if the price fell. Dial-up users, as a group, are older and less well-off economically than their broadband counterparts: 29% of dial-up users live in households with annual incomes below $30,000 compared to 14% of broadband users in that income range. Some 43% of dial-up users are age 50 or older versus 29% for broadband users. Finally, it is worth noting that dial-up users are disproportionately female and inhabitants of rural areas. Some 61% of dial-up users are women and 30% live in rural areas (compared to 13% of all broadband users in rural America). Lack of broadband availability looms in the mind of some dial-up users. Some dial-up users cite lack of availability as a reason they don’t switch to broadband. When asked what it would take to switch to broadband, one in ten (10%) dial-up users said they would make the change if it became available where they live or if their cable or phone company offered the service. When both dial-up and non-internet users are asked generally whether “high-speed internet service is available in your neighborhood from a telephone company, cable company or any other company,” one-quarter (24%) say “no” and 13% respond that they do not know if it is available. Whether framed in general terms to all non-broadband users or more narrowly only to dial-up users about whether availability is a barrier to switching, users’ respondents must be interpreted in the proper context. Users may report incorrectly about whether broadband is available where they live; in fact, broadband service is available everywhere a home can receive a satellite signal, although such service is typically more costly than and not as fast as DSL or cable service. Non-internet users in particular may be unreliable sources for information about the availability of a technology they do not use. Nonetheless, the fact that rural residents are more likely to report that broadband isn’t available where they live indicates that infrastructure availability comes into play in broadband adoption. Some 28% of rural adult Americans without home high-speed say broadband isn’t available where they live, in contrast to 22% of non-rural Americans without broadband who say this. Moreover, 15% of dial-up users in rural areas say having the service available where they live would prompt a switch to broadband; this compares to the 10% figure for all respondents. Non-internet users – one-quarter of adults – represent the largest group of those without broadband. Our April 2008 survey recorded 73% of American adults as internet users, meaning 27% of adults in the United States do not use the internet. Age and income are two factors that stand out when looking at non-internet users. Although these demographic and socio-economic factors are powerful forces keeping some people off the net, many non-users are not completely disconnected from cyberspace.6 Some 21% of non-users say that someone in their household uses the internet at home. And one-fifth of non-users at one time user the internet; 18% of non-users said they had been in the past, and 10% of non-users said they would be interested in using the internet again. 33% of non-internet users say they are not interested in the internet. Still, one-third (33%) of non-internet users say they are simply not interested in the internet, with another 12% saying they don’t have access. Some 9% of non-users say the internet is too difficult or frustrating for them and just 7% say it is too expensive. Attitudes about information technology shape the broadband choice. As the preceding discussion shows, socio-economic and demographic factors play large roles in explaining whether someone has broadband or not. Upper-income Americans are more than three times more likely to have broadband than low-income Americans to have broadband at home. Similarly, young adults are far more likely than senior citizens to have broadband at home. 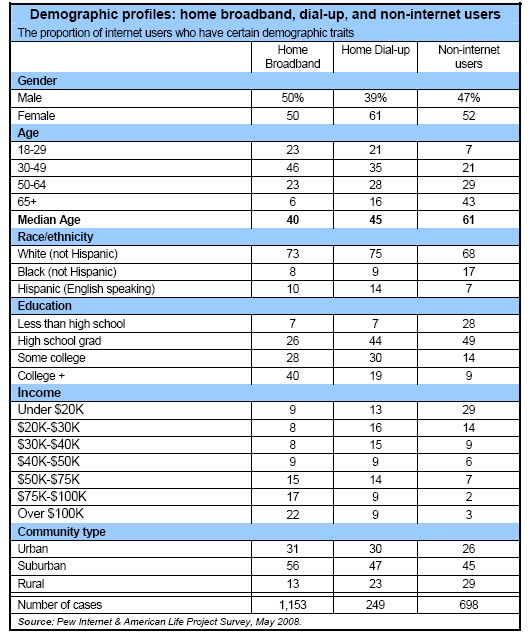 The following table presents a demographic profile of online users versus non-internet users and clearly shows difference among these groups, as non-users are older and less wealthy than home dial-up or broadband users. As powerful as these associations are, they are not the only things at play in broadband adoption decisions. People’s attitudes about information technology are also important. An older person may love to tinker with technology and enjoy the “always on” information pipeline that broadband offers. A person in a low-income household may be willing to allocate scarce discretionary funds to broadband – if he feels the connectivity offers something of value. A majority (67%) of broadband users view electronic devices, to some extent, as an aid to personal productivity, while a minority of dial-up users (46%) sees modern gadgetry in this way. This suggests that people’s age and income are not the only things behind the broadband choice. How people view the productive potential of information technology is also relevant – and not everyone sees this potential in the same way. Few dial-up users take advantage of high-speed wireless connections to the internet. With just more than one-third of broadband users saying they would like to get broadband, one might expect some to look for ways to connect via high-speed outside the house. As noted, 25% of all adults (or 34% of internet users) have gotten online away from home or work using a laptop and a WiFi wireless connection. However, the practice of using WiFi connections away from home or work for online access is mainly the province of home broadband users. Some 40% of home broadband users have done this compared with 12% of those who use dial-up to go online from home. Put differently, 95% of those who say they have used a WiFi connection to go online are home broadband users. WiFi is not the only wireless means of accessing the internet. Increasingly, handheld devices such as cell phones or personal digital assistants (such as Blackberries or iPhones) offer a pathway to the web. Some 39% of internet users say they have used a handheld device to go online – the figure is 41% for home broadband users and 36% for home dial-up users. Given the dwindling number or home dial-up users, this means that some 86% of those who use a handheld to access the internet are broadband users. Although some cell phone networks today are capable of transmission rates of 200 kilobits per second (the FCC-defined threshold for a “first generation” broadband), it is difficult, if not impossible, to determine how many.8 And even 3G services that might reach 700 kps are below the threshold for “basic broadband” service.9 These figures suggest that the few dial-up users who do connect to the internet with a handheld device are experiencing fast speeds, so that handheld online access cannot be seen as a substitute for having a high-speed internet connection at home.